The Contractor Fire Point Stand is very robust and ideal for moving the fire point across site. 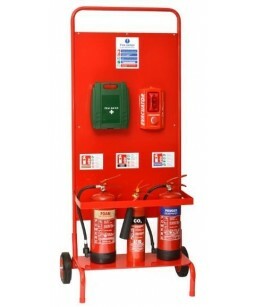 Powder Extinguishers: are especially suited to mixed fire risk environments and a good all round extinguisher. They are also suitable for risks such as methane, propane, hydrogen, natural gas, etc. Foam Extinguishers: are ideally suited where both class A & B fire risks exist. Aqueous Film Forming Foam or AFFF is particularly suited to fight liquid spill fires such as petrol, oil, fats, paints, etc. and works by forming a film on the liquid to extinguish the fire. This extinguisher has also passed the electrical conductivity test at 35kv. 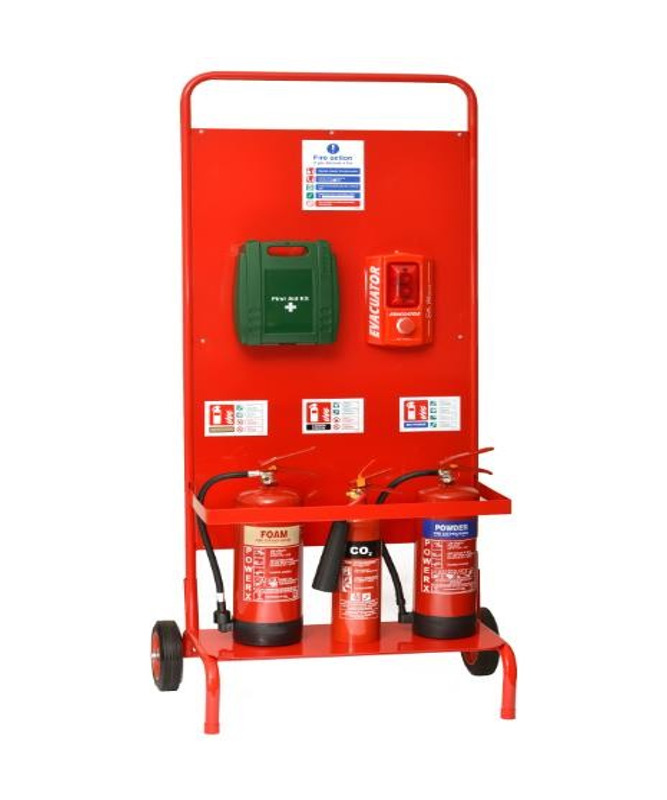 Co2 Extinguishers: suitable for Class B risks involving flammable liquids and electrical hazards. These extinguishers have been a natural replacement for Halon. Co2 is harmless to electrical equipment and is ideal for modern offices, electronic risks and fires caused by the combustion of liquids such as oils, fats, solvents, etc. This unit has the highest fire rating in its class. Identification Signs: a rigid plastic ID sign showing the relevant person exactly what type of fire the extinguisher can and cannot be used on. First Aid Kits: are essential in any work place regardless of the size of premises. Contains everything you are likely to need to administer first aid at work along with a fixing bracket to fix the first aid kit. Fire Action Notice: the fire action notice is to show the relevant person what to do if they discover a fire or hear a fire alarm. The Evacuator Sitemaster Push Button Fire Alarm: designed for emergency situations, extremely versatile, reliable and easy to use. Simply push the button to activate. For use in temporary buildings, premises under construction and camp sites. The Evacuator Sitemaster can either be used as a stand alone alarm for small sites or can be linked up to 20 other units for larger sites. 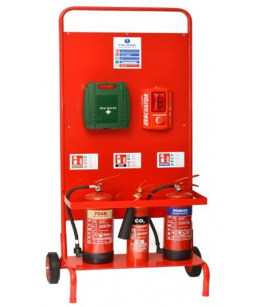 Please note all fire extinguishers we supply are certified and tested when leaving the factory, once delivered and put in place they should be checked and certified by a competent person, thereafter an annual maintenance test should be carried out by a competent person.